WASHINGTON – Election eve 2016 began without any real sign of a gathering storm. No hint a popular revolt was brewing. In fact, just the opposite. The networks were reporting the mood in the inner circle of the Republican candidate was subdued, somber, tense, even foreboding – as if fearing the worst. In direct contrast, the mood in the camp of the Democratic Party presidential candidate was described as confident, expectant and already almost celebratory. When the first polls closed on the East Coast and the first results began to come in, those moods seemed to be swiftly confirmed by reality. The pre-election polls were not wrong. Democratic Party nominee Hillary Clinton immediately took the lead. And she was winning in the battleground states. She was leading in Florida. She was leading in North Carolina. She was leading in Pennsylvania. She was leading in Ohio. Clinton was threatening to pull away and end the suspense early. At 7 p.m., there was no sign of a popular uprising led by Republican presidential candidate Donald Trump. There was no sign at 8 p.m. There was still no sign as time inexorably marched on. Something would have to break. Like a scene out of the film “It’s a Wonderful Life,” people had begun to pray. But not just in one small town. Across America. And around the world. Simple acts of faith heralded the first faint wisps of a breeze that would soon become a storm that would shake the world. Christians from many nations gathered in the heart of Israel to pray and fast for the fate of the United States. Americans knelt on stage as the faithful prayed. Organizers instructed them to pray like never before for a just God to deliver his most Christian nation. They called it the Jerusalem Global Gathering. Christians also gathered to pray for the nation outside the U.S. Capitol. As WND reported, pastor Dan Cummins of the small rural East Texas town of Bullard led prayers for a return to biblical principles. And it was in Texas that the prayers for deliverance were sent around the world, using modern technology. A large prayer group had gathered in Dallas, hosted by Ken Copeland ministries. It was broadcast by the Daystar channel. Presenters David Barton and former Rep. Michele Bachmann, R-Minn., invited viewers to join in prayer. Daystar has a global reach of 400 million potential viewers. As they prayed, something began to stir. “We knew it was at the exact same time that believers joined in corporate prayer on behalf of voting for a godly platform. Believers brought the Lord into this election, and that made all the difference,” added the devout believer. “That is the story of last night’s victory. I have no doubt. The strong right arm of a holy God heard the prayers of His people and graciously answered our prayers,” Bachmann reflected. And there is no doubt someone was listening. In addition to the hundreds-of-millions of viewers within Daystar’s reach, the event drew about a million views online. “We were told more believers came out to vote in this election than ever before,” she reflected, and the numbers confirmed that. Trump benefited from the largest evangelical turnout in history. Exit polls showed that an overwhelming 80 percent of white evangelical voters (who made up 25 percent of all 2016 voters) supported Trump. Evangelicals of color preferred Clinton, but she did not get the same support from Hispanics and African-Americans as did President Obama. Polls also showed that Trump recaptured the Catholic vote for the GOP by a margin of 52 percent to 45 percent, after most of them voted for Obama in the two previous presidential elections. Despite the victory, she concluded the work has just begun for the faithful, as well as the president-elect. So, what did happen around 8 p.m. Eastern time, when the Times indicated the odds favoring Trump began a dramatic turnaround in his favor? 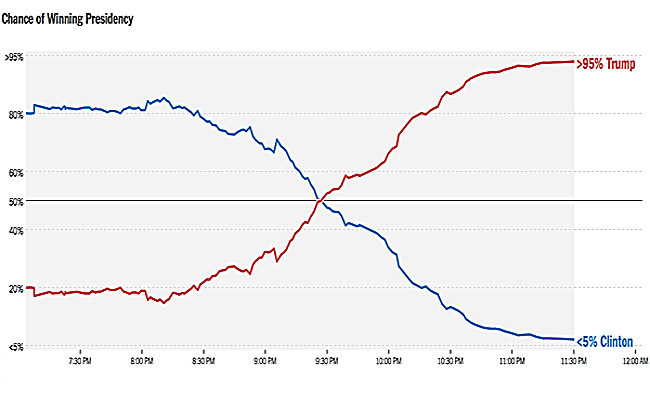 Did prayers sway the vote, or did they coincide with the moment the tabulations began to swing to Trump? Either way, there could be a case to be made that the Trump victory was not really the work of man, because man chose Clinton. She won the popular vote. Just as the polls predicted. But it was where those people voted that made all the difference. Providentially, perhaps, the shift toward Trump happened in the key swing states needed to push him over the top in the all-important Electoral College. From that perspective, Trump’s victory might indeed be seen, even by the skeptical, as less the work of man, and more of an act of God.